Pews are part of your church’s physical environment, inanimate furniture that affects the look of the church. But they are also part of the environment your congregation enjoys during services. That means that you have to consider your church community when you think about choosing pews. Do you have elderly people in the congregation? Many older people have trouble sitting down and standing up, and may need more room for the process than younger people do. They may lean on the pew ahead of them for help getting up and down, so it has to be quite stable. Older people may also need more padding to be comfortable than younger ones. Blessed with plenty of children? You’ll want stain-resistant upholstery for your pews. You may not need as much space f0r your congregation as a church with an older population, though — little children take up less room than adults. When you choose the style of your pew ends, watch out for sharp corners. 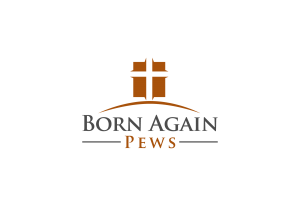 At Born Again Pews, we make sure all the pew ends are beautifully finished, but a curved edge can still be safer than a more angular one. A lot of communities in America are finding that they need more space in the pews because people are larger. Seating linebackers is different from seating smaller people. Have a look around the sanctuary and make sure the standard 15-18″ per person is realistic for your community before you rely on those numbers in your planning. If your ladies wear dresses to church, a privacy screen or modesty panel like the one in the picture can make everyone more comfortable — and don’t forget the choir loft, if your choristers aren’t robed. On the other hand, if mobility issues are important in your church, with wheelchairs and walkers used by many, then seating that’s quite open is important. It can be hard to plan accurately for your community because nothing is more certain than change. If you plan to reach out to young couples, you may have more children in the future — and of course we all hope that our church members will live to a ripe old age and be in church all their lives. Whether you can feel confident about what your church community will be like in the future or not, you’ll be glad you spent a little time thinking about the specific needs of the community when you make the important choice of pews for your church. Please don’t hesitate to call us to discuss your needs. We have experience building and installing pews all over the country, and we’ll be happy to share our knowledge with you.